Fireplaces are making a comeback, adding romance, grandeur or a modern edge to a room. And they can make or break a sale, says Christopher Middleton. But as Christmas approaches every year (I know it's still a long way off), the crackling logs and glowing coals of yesteryear inevitably come to mind. And now fireplaces are reappearing in people’s homes, too. The humble hearth is returning to fashion. Designers are installing sophisticated, environmentally friendly versions in modern flats and houses. And buyers of properties of all sizes are seeking them out. 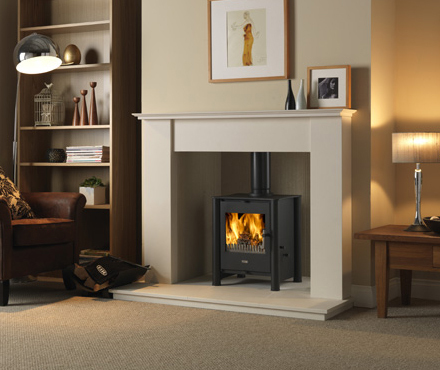 A fine marble surround or contemporary wood-burning stove can not only clinch a sale, but add thousands to a property’s value. “The fireplace has made a real comeback,” says Dawn Carritt, a historic home expert and director of Jackson-Stops & Staff. “There was a period in the second half of the 20th century when it was thought to have become irrelevant. This was in part because of the introduction of smokeless zones and fewer domestic staff to remove the ashes from the grate.” So what has rekindled our affection? Why do we now see it not as a waste of space, but a must-have feature? Inevitably, it’s a combination of factors. There is the soaring cost of heating bills as well as a nostalgic urge to batten down the hatches and gather around a fire in troubled economic times. Even the television series Downton Abbey has played its part. It is helping inspire a return to a more traditional way of British life. Whether period pieces, new designs in old rooms or entirely contemporary affairs, fireplaces cannot be ignored. “Whenever we ask prospective country house buyers what they want more than anything else, the reply is always the same: 'We must have a fireplace,’” says Carritt.